Twinkle is a sweet loving puppy. Adopt her today! Twinkle is looking for her forever home. If you think it could be yours, read more about Adopting from BDRA before submitting your application below. BDRA relies on your donations to rescue blind dogs around the United States. Please consider giving in support of Twinkle. Twinkle continues to do well in her foster home. She is now 6 months old and weighs 18.9 lbs. She loves to play with her foster fur family and loves outside play and she looks forward to several walks a day. Twinkle can run like a deer and hop like a fox. Twinkle is doing well and she is growing quickly. She has the longest legs that help her run like a deer. She is very dainty looking. She loves walks, toys, especially balls and frisbees. Her favorite thing to do is to run and play with the dogs in her foster home. Twinkle has lots of energy so she needs to be adopted to a very active family. She is no couch potato but has tons of love to give. Older children and a fence is needed for Twinkle. She is also very jumpy with excitement in other dogs faces. So another dog would need to be understandable of Twinkle’s energy and wanting to play like a typical Aussie puppy with all the energy. Twinkle continues to do well . She has lots of energy and needs alot of outside excercise to channel her energy. Twinkle loves walks and to run and play with her foster family. Twinkle enjoys chasing balls and Frisbees. Twinkle is a sweet loving puppy. Twinkle will need a fence and never to be off leash outside of a fenced in area. She also would do best with older children. Twinkle is now 16 wks. old. She is spayed and up to date on all vaccines. Twinkle is maintained on HW and Flea Preventative. Twinkle is making great progress with Housebreaking with a few accidents. She walks well on a leash. She rides in the car with a harness. We are still working with Twinkle on crate training. She does do well in the expen and sleeps through the night. Twinkle loves other dogs but is still very jumpy with excitement and jumps in their faces. If she finds a home with other dogs they will need to be understandable of her puppy ways and in your face kind of play. 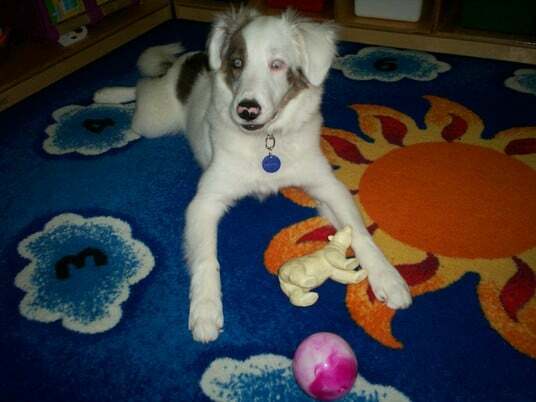 Twinkle is Deaf and Vision Impaired but she does seem to see a great deal. She can follow others and chase balls and loves a Frisbee. She is also very loud when she barks. 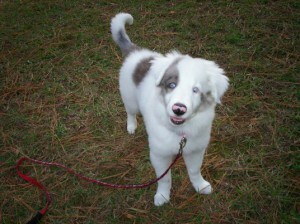 Twinkle has all the Australian Shepherd energy and loves several walks a day and playtime in the backyard. She is full speed ahead and eager to learn new things. She is a sweetheart and loves interaction with others. We feel a home with a fence would be preferred for Twinkle . Twinkle would do best with older children since she has so much energy and is still jumpy. Twinkle can never be off leash when outside a fenced yard. Twinkle is a sweet 13 week old Australian Shepherd who is deaf and vision impaired. Twinkle does have some vision and tracks and follows others. Twinkle loves to go for walks and play with the other dogs in her foster family.Twinkle is making progress with the leash and is working on housebreaking.Twinkle loves all toys. She travels well with a dog safety harness. She sleeps all night in an expen without complaining. Twinkle is new to her foster family in the Savannah Ga. area so please look for future updates.